It's still a bit nippy in Paris, but it's April and that means spring has come to the Côte d'Azur. People are welcoming daylight savings time, the big Easter weekend ("les fêtes Pascales") and warmer weather all the way from Cannes to Monaco. 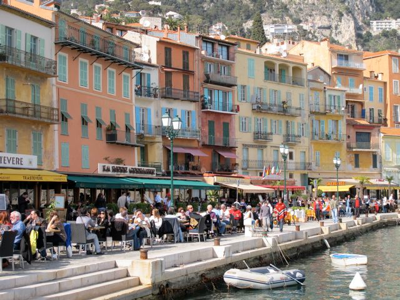 Crowds are strolling Nice's broad Promenade des Anglais and enjoying the waterfront cafés in the appealing town of Villefranche-sur-Mer (left). Villefranche, besides being a popular Riviera destination with a fascinating history, is also home to l'Institut de Français, a total-immersion language school whose current enrollment includes this francophile and people of varying ages and occupations from virtually every corner of the globe. The learning experience high up in the hills of Villefranche comes with a spectacular view of the deep-water bay and Cap Ferrat beyond. And if spring has sprung here in the south, it can't be far behind in the rest of France.